Ever wonder how the top-of-the-line superbikes used by the pros compares to your less expensive rig? Active tested Trek's Speed Concept 9.9 to find out how this high-end bike stacks up. The new re-design of the Speed Concept in 2014 improved overall speed over the 112-mile Ironman bike leg by 1 to 2 minutes over its predecessor. Part of the credit for this improvement to an already extremely fast bike are the larger gussets—the area where the tubes of the bike join. The redesign of the front fork likely plays a major role in the improved speed of the 2014 model. The shape and how the fork interacts with the wheel is a major factor in aerodynamic performance. Both front and rear brakes have been redesigned for the 2014 model. The front brake is built into the front fork for increased aerodynamics. The rear brake is so well hidden it can almost be hard to find. The good news is, it's much easier to adjust than previous Speed Concept bikes, which was truly a pain if you used wheels with different widths to train and race. The Aeolus 5 is a versatile wheel that performs well in windy conditions. The OCLV carbon makes the wheelset light, durable and stiff. Rim depth is 50mm, and the wide shape (27mm outer, 17.5 inner) produces a rim that lowers wind drag when used with Bontrager tires. Stacked lacing provided good stiffness and the white spokes are eye-catching. While we liked how these wheels performed overall, our guess is that some will still want a deeper rim profile to make this superbike a bit more studly—and perhaps even faster. An option to choose wheelsets should be an option at this price point. Superbikes and cockpits on tri bikes can be hell to adjust. While we wouldn't call this one easy, it's easier than most. Fore/aft adjustment of the aerobars can be done by removing four bolts—a feat that was accomplished without a trip to the mechanic. You'll also notice that all of the electronic drivetrain parts are internally routed, which makes the bike look fast and clean. The storage containers on the Speed Concept are add-ons, which means they aren't included in the price. The good thing about these devices is that Bontrager designed these to work specifically for this bike with aerodynamics in mind—something other companies have failed to do. Since you'll need to carry spare tubes and food for a 112-mile course, the extras are essential. Trek claims that putting these add-ons on the bike actually makes it faster by an additional 4 minutes, which is quite impressive. What we didn't like was that these extras were plastic. On a $12,000 bike, the expectation is that these parts would not only come with the bike, they'd also have a higher level of craftsmanship, and use of a higher-quality material. The rubber feedbox that screws into the top tube makes it easy to eat without having to fiddle around with zippers like a lot of other food storage units. It's also supposed to make the bike faster—and it looks good too. The idea for the aerobar-mounted bottle cage makes sense, but you'll still need cages on the back of the bike too. The computer mount option on the cage didn't work as well as we'd hoped either—you still need to look back quite a bit to get a good view of your numbers. A mounting option that's a bit more forward on the bars would have been better. You won't hear any complaints from us with the incorporation of electronic drivetrains. The Shimano Dura-Ace Di2 components might not be traditional, but the performance is unparalleled. You get precise shifts every time with the push of a button; you'll never have to deal with chain drops again. The lack of cables and single pulley wheel give the electronic rear derailleur and clean look. 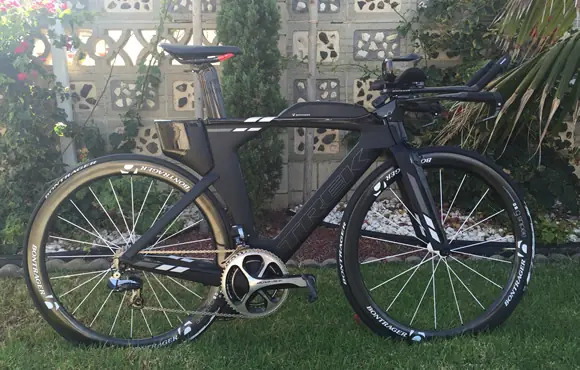 One of the fastest and most expensive triathlon bikes on the market, I expected big things from the Speed Concept 9.9 and it did deliver. The agility through turns and tight corners was a surprise and a detail that often goes overlooked, as triathlon bikes usually only focus on straight-line speed. The stiffness and compliance of the frame was also noteworthy. You'll notice right away that once you get up above 18 mph all of your energy is being transferred as efficiently as possible—a feeling that you might not notice until you try a superbike for yourself. What stood at to me the most though was the pure speed and comfort that this bike design accomplishes. Some bikes are fast, and others are comfortable, but it's tough to find a machine that is both. On a short 40K time trial, I was able to shave a full minute off my personal best—and my race results this season don't indicate that I'm in the shape of my life. As for comfort, a 100-mile ride produced less fatigue from road vibration and wasted energy during power transfer. This bike has a cruising mode that really is remarkable—it almost makes you feel like your riding on a motorbike. While this might not justify the price for some, it does come down to how much you have to spend. Is this bike better than the Cervelo P3, or other top models in the $5,000 to $7,000 price range? Absolutely. Whether or not it's worth the price for you is something you'll have to determine for yourself.